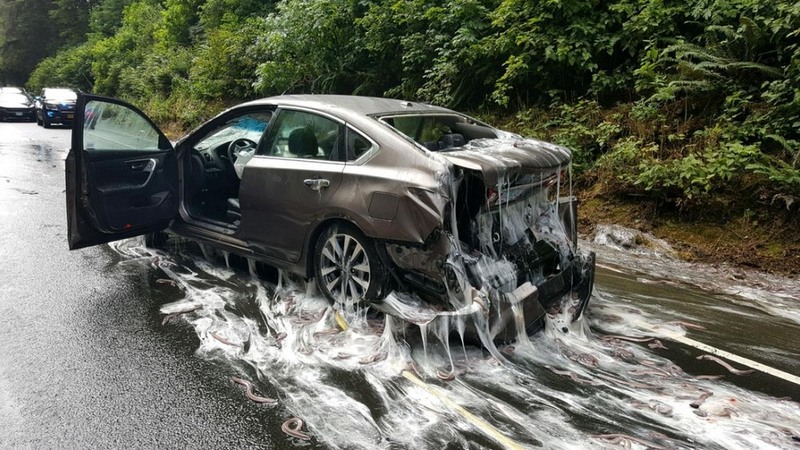 Hagfish, or slime eel, is a scavenger fish that resembles an eel and has the ability to generate massive amounts of slime in a matter of seconds. When combined with seawater, the slime rapidly expands and creates huge volumes. The hagfish use slime to protect itself from predators. 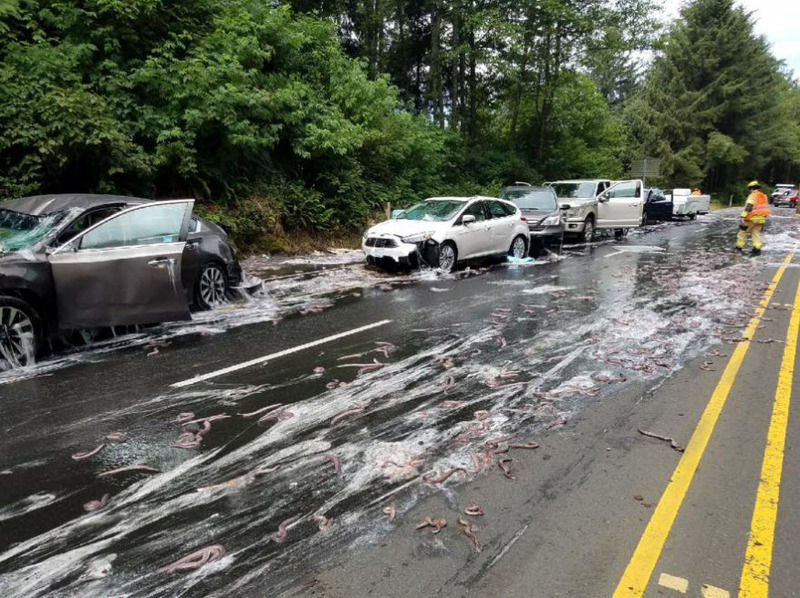 When agitated or under threat, the hagfish secrets copious quantities of this milky and fibrous slime that clogs the gills of predator fish, such as sharks, disabling their ability to respire. Because of this defense mechanism, few marine predators bother to disturb the hagfish. The hagfish also use slime to mark their territory. When feeding on the carcass of dead whales—their favorite food—the fish release so much slime that they cover the carcass, preventing other scavengers from creeping in on their turf. Despite its repulsive secretions, the hagfish is a delicacy in many Asian countries, especially South Korea. The fish itself is rarely eaten because of its unpleasant aftertaste. Rather, the hagfish is kept alive and irritated by rattling its container with a stick, causing it to produce large quantities of slime. This slime is collected and used in many Asian cuisines the same way egg whites are used. The containers that overturned on the Oregon highway were destined for South Korea. The fish were already agitated by motion of the trailers, so the containers were probably full of slime when it overturned. 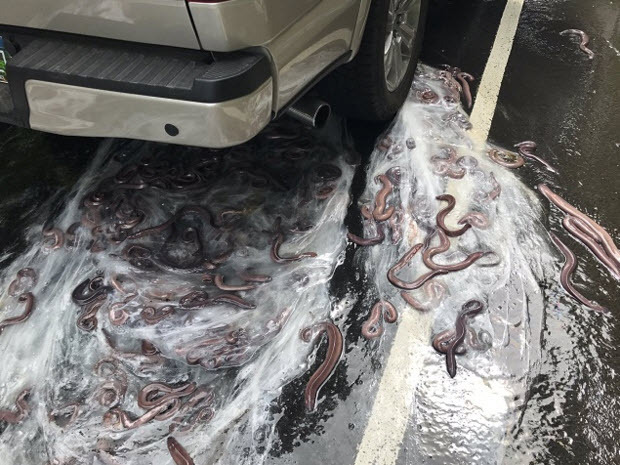 The final act most likely triggered an intense slime producing reaction covering the cars on the highway with muck. Lately, scientist are trying to find out if the slime could be used to produce silk, from which a range of apparel could be woven. A couple of Canadian researchers at the University of Guelph successfully dried out the slime to create a silky, stretchy substance. In future, hagfish slime might replace petroleum-based Kevlar in bulletproof armor, and spandex and nylon from your clothes.